Because we can't all have our own personal bartender. If you’re like me, your favorite place to drink is in your living room. But imbibing your go-to cocktails night after night made with whatever you have stocked in your home bar can get old really fast. 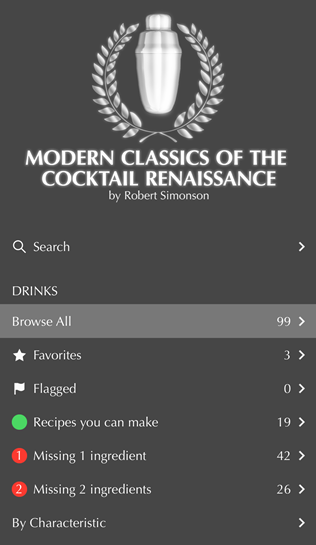 Thankfully, there are a few cocktail recipe apps that allow the user to enter what ingredients they have in their inventory. Typically, the recipes are either for things like raspberry margaritas, Long Island Iced Teas, or the usual classics. Fortunately, Robert Simonson, New York Times drinks writer and author of the upcoming cocktail book A Proper Drink: The Untold Story of How a Band of Bartenders Saved the Civilized Drinking World, came up with the perfect app for home bartenders—in other words, folks who want to drink cocktails from places like Chicago’s The Violet Hour, Portland’s Clyde Common, and New York’s Milk and Honey, but can’t actually go there. 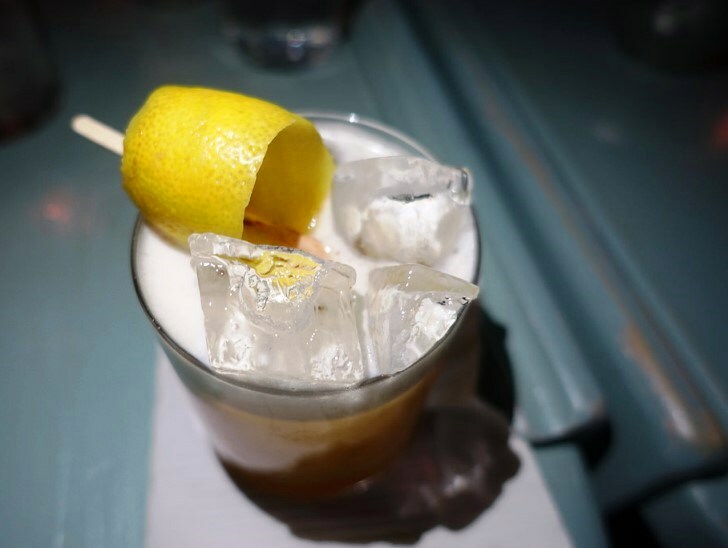 The recipe for this, the best Amaretto Sour you ever had, is in this app. Modern Classics of the Cocktail Renaissance is a straight catalog of popular drinks that arose from our current cocktail renaissance, and even those recipes from the ’70s to the ’90s that helped lay the foundation for it all. No cocktail photos, but it has everything from the original recipe for the Cosmopolitan to the crafty and improved Amaretto Sour. Currently there are 99 different recipes, but Simonson says the database will constantly be updated. Bonus is that a lot of these recipes are actually easy to make, meaning they don’t require a hot poker or sous vide machine. 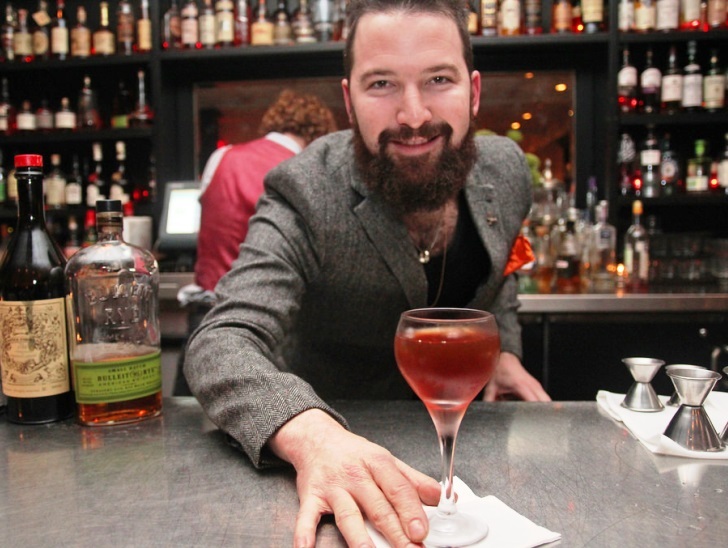 The only one that would take some fussiness is Jeffrey Morgenthaler’s Barrel-Aged Negroni, which calls for a 3-gallon barrel, a cheesecloth, and seven weeks. Modern Classics has immediately become one of my most favorite cocktail apps ever. It’s got recipes from all my favorite bartenders with little historical tidbits I can share with my guests as I make them these drinks. It’s also super intuitive to use. Like other cocktail recipe apps, it’ll tell you which cocktails you can make according to the inventory of ingredients you enter into the database. But it will also suggest recipes where you’re missing two ingredients. Extra helpful is the ability to list recipes by characteristic (“stirred,” “shaken,” “low ABV,” and even “Critic Pick”) or by base spirit (tequila/mezcal, wine, sake). And of course you can save your favorites for easy retrieval later. The app is $9.99 but if you already invest in Japanese shaking tins and silicone ice molds, you’d do well to regard it as yet another way to raise your cocktail game.